A new device has topped the AnTuTu Android benchmark software ranking list chart, taking over the Transformer Prime with the quad-core Tegra 3. The device is uploaded as the Samsung Galaxy SIII, which was the preferred name for the next Galaxy flagship before it became clear that Samsung itself is calling it Galaxy S3. The device info section uses a popular render of the SGS3 for a picture placeholder, and lists the processor as a 1.4GHz Exynos 4212, which is the fishy part, as Samsung just made the quad-core 4412 official and said it will go into the "next Galaxy" in May. The other specs are a 4.7" HD display, and 12MP camera, which coincide with Amazon Germany's preorder listing for the phone, so we more or less know what's shaking for the May 3 announcement. The big question mark is design, and Samsung is so tight-lipped about it, that we suspect torture chambers being set up in the HQ basement for any tester that leaks the final ceramic looks. 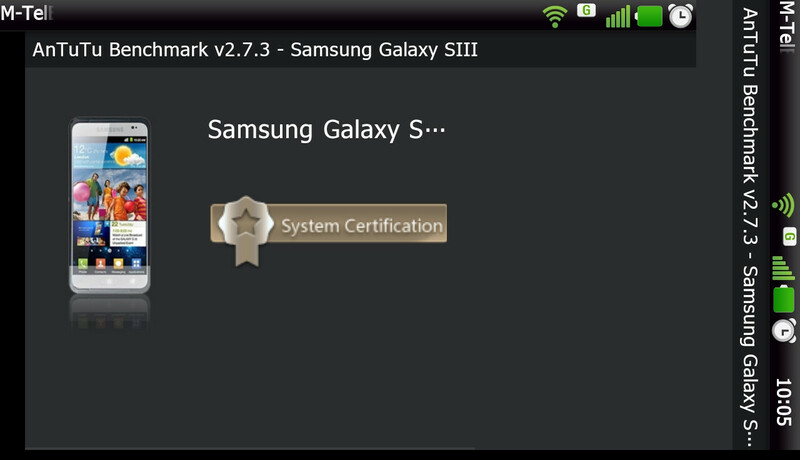 You're wrong there, the 4212 it's the 32nm version of the 45nm dual core 4210 in the Galaxy S2. The quad core version of the 4212 its the 4412.
sorry mate but your wrong "The Exynos 4 Quad, also known as the Exynos 4212 (previously as the 4412)"
I'm not sure where you got that from, but tha's not what Samsung themselves are telling:http://www.samsung.com/exynos 4412 is the "Exynos 4 Quad" 4212 is the "Exynos 4 Dual 32nm" It has also been changed in Wikipedia:http://en.wikipedia.org/wiki/Exynos It seems that they are changing the way to name chips. 200megapixel !! Is this written or i am alone !! 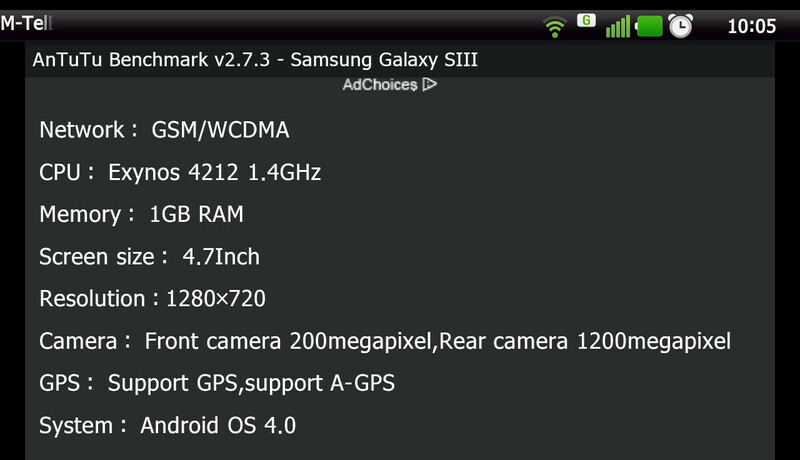 It's actually 2mp front and 12mp on the back, its shown in some kinda decimal form or something. It's actually the s4, I don't think you want the out dated and slow s3. 1gb ram memory? s**t just got real..at least 1.2/4 sammy. In your photo: - The length of One X: 67 mm - The length of TF201: 63 mm => Antutu benchmark of tf201 in Antutu list: 10561. In the photo of this article: - The length of GS3: 27.5 mm - The length of TF201: 23 mm => Antutu benchmark of GS3: 12627 with Exynos 4212 1.4 GHz Powerful!!!!! 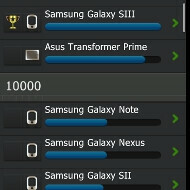 I meant the bar of GS3 benchmark, ok? You sure? Because I see the S3 having better camera,and also a better processor than the over hyped tegra 3. How much have you been smoking? Tegra 3 and Exynos 4412/4212 have the same CPUs, 4 Cortex A9s at 1.5 GHz. Of course, I wouldn't be surprised to see the Exynos much better, seeing as how Nvidia made idiotic decisions outside of the CPU, like single channel LPDDR2 (Exynos is dual channel, so is Snapdragon S4 and any other modern SoC), so it will choke under high load, and the GPU is still crap. No built in modem on Tegra 3 means it doesn't have the Snapdragon advantage either. Tegra 3 is good for being first, but they cut too many corners to get there. It will do 95% of what the Exynos does, but it's still not as good as it could be. They don't "have the same CPU" for one the exynos 4412 is 1.4ghz quad, its also on a 32nm using HKMG transistors instead of the manufacturing process used for 40nm. Do you even understand what you're saying? Yes, 32nm HKMG uses less power than 40nm. No, it doesn't change the fact that it is the same architecture CPU at the same speed. Go read up on Sandy Bridge and Ivy Bridge CPUs. The Ivy Bridge is a dieshrink with minor architectural improvement, at the same clockspeed it is only 3-5% faster, which is the same as absolutely no change. The difference is that Ivy Bridge can use less power. I wasn't referring to the HKMG making it faster, just the fact that its on the die, I was referring to the fact that the 32nm will be faster, nothing more, nothing less. That argument still is nonsensical. Yes, it will clock higher on 32nm HKMG than 40nm. This is not being clocked higher. There is no performance advantage. An 80286 made on 32nm at the same speed as an 80286 made on 260nm will have the same performance, just that one will use immensely less power than the other. That is how it is. Stop trying to put Exynos on a pedestal. It will probably beat Tegra 3, but it comes down to doing what Tegra 3 didn't, which is proper design. i thought the ram was 2gb!!! !